Salmon Portland Chase (January 13, 1808 – May 7, 1873) was a U.S. politician and jurist who served as the sixth Chief Justice of the United States. He also served as the 23rd Governor of Ohio, represented Ohio in the United States Senate, and served as the 25th United States Secretary of the Treasury. Chase was therefore one of a few US politicians who served in all three branches of the federal government. Born in Cornish, New Hampshire, Chase studied law under Attorney General William Wirt before establishing a legal practice in Cincinnati. He became an anti-slavery activist and frequently defended fugitive slaves in court. Chase left the Whig Party in 1841 to become the leader of Ohio's Liberty Party. In 1848, he helped establish the Free Soil Party and recruited former President Martin Van Buren to serve as the party's presidential nominee. Chase won election to the Senate the following year, and he opposed the Compromise of 1850 and the Kansas–Nebraska Act. In the aftermath of the Kansas–Nebraska Act, Chase helped establish the Republican Party, which opposed the extension of slavery into the territories. After leaving the Senate, Chase served as the Governor of Ohio from 1856 to 1860. Chase sought the Republican nomination for president in the 1860 presidential election, but the party chose Abraham Lincoln at its National Convention. After Lincoln won the election, he asked Chase to serve as Secretary of the Treasury. Chase served in that position from 1861 to 1864, working hard to ensure the Union was well-financed during the Civil War. Chase resigned from the Cabinet in June 1864, but retained support among the Radical Republicans. Partly to appease the Radical Republicans, Lincoln nominated Chase to fill the Supreme Court vacancy that arose following Chief Justice Roger Taney's death. Chase served as Chief Justice from 1864 to his death in 1873. He presided over the Senate trial of President Andrew Johnson during the impeachment proceedings of 1868. Despite his service on the court, Chase continued to pursue the presidency. He unsuccessfully sought the Democratic presidential nomination in 1868 and the Liberal Republican nomination in 1872. Chase was born in Cornish, New Hampshire, on January 13, 1808, to Janette Ralston and Ithamar Chase, who died in 1817 when Salmon was nine years old. His paternal immigrant ancestor was Aquila Chase from Cornwall, England, a ship-master who settled in Newbury, Massachusetts about 1640, while his maternal grandparents Alexander Ralston and Janette Balloch were Scottish; originally from Falkirk. His mother was left with ten children and few resources, and so Salmon lived from 1820 to 1824 in Ohio with his uncle Bishop Philander Chase, a leading figure in the Protestant Episcopal Church in the West. U.S. Senator Dudley Chase of Vermont was another uncle. He studied in the common schools of Windsor, Vermont, and Worthington, Ohio, and at Cincinnati College before entering the junior class at Dartmouth College. He was a member of the Alpha Delta Phi Fraternity and Phi Beta Kappa, and graduated from Dartmouth with distinction in 1826. While at Dartmouth, he taught at the Royalton Academy in Royalton, Vermont. Chase then moved to the District of Columbia, where he opened a classical school while studying law under U.S. Attorney General William Wirt. He was admitted to the bar in 1829. The Salmon P. Chase Birthplace and childhood home still stands in Cornish, New Hampshire. Chase moved to a country home near Loveland, Ohio, and practiced law in Cincinnati from 1830. He rose to prominence for his authoritative compilation of the state's statutes, which long remained the standard work on the topic. From the beginning, despite the risk to his livelihood, he defended people who escaped slavery and those tried for assisting them. He became particularly devoted to the abolition of slavery from the death of his first wife, Katherine Jane Garmiss, in 1835, shortly after their March 1834 wedding, an event which was a spiritual reawakening for him. He worked initially with the American Sunday School Union. At a time when public opinion in Cincinnati was dominated by Southern business connections, Chase, influenced by local events, including the attack on the press of James G. Birney during the Cincinnati Riots of 1836, associated himself with the anti-slavery movement. Chase was also a member of the literary Semi-Colon Club; its members included Harriet Beecher Stowe and Calvin Stowe. Chase became the leader of the political reformers, as opposed to the Garrisonian abolitionist movement. For his defense of people arrested in Ohio under the Fugitive Slave Law of 1793, Chase was dubbed the Attorney General for Fugitive Slaves. His argument in the case of Jones v. Van Zandt on the constitutionality of fugitive slave laws before the U.S. Supreme Court attracted particular attention. In this and similar cases, the court ruled against him, and the judgment against John Van Zandt was upheld. Chase contended that slavery was local, not national, and that it could exist only by virtue of positive state law. He argued that the federal government was not empowered by the Constitution to create slavery anywhere and that when an enslaved person leaves the jurisdiction of a state where slavery is legal, he ceases to be a slave; he continues to be a man and leaves behind the law that made him a slave. Elected as a Whig to the Cincinnati City Council in 1840, Chase left that party the next year. For seven years he was the leader of the Liberty Party in Ohio. He helped balance its idealism with his pragmatic approach and political thought. He was skillful in drafting platforms and addresses, and he prepared the national Liberty platform of 1843 and the Liberty address of 1845. Building the Liberty Party was slow going. By 1848 Chase was leader in the effort to combine the Liberty Party with the Barnburners or Van Buren Democrats of New York to form the Free Soil Party. Chase drafted the Free-Soil platform and it was chiefly through his influence that Van Buren was their nominee for President in 1848. In 1849, Chase was elected to the U.S Senate from Ohio on the Free Soil ticket. Chase's goal, however, was not to establish a permanent new party organization, but to bring pressure to bear upon Northern Democrats to force them to oppose the extension of slavery. During his service in the Senate (1849–1855), Chase was an anti-slavery champion. He argued against the Compromise of 1850 and the Kansas–Nebraska Act of 1854. After the passage of the Kansas-Nebraska legislation and the subsequent violence in Kansas, Chase cut back on his efforts to influence the Democrats. He was a leader in the movement to form a new party opposing the extension of slavery. He tried to unite the Free Soilers and the anti-slavery Democrats with the dwindling Whig Party, which led to establishment of the Republican Party. "The Appeal of the Independent Democrats in Congress to the People of the United States", written by Chase and Giddings, and published in the New York Times on January 24, 1854, may be regarded as the earliest draft of the Republican party creed. In 1855 he was elected governor of Ohio. Chase was the first Republican governor of Ohio, serving from 1856 to 1860, where he supported women's rights, public education, and prison reform. Chase sought the Republican nomination for president in 1860. With the exception of William H. Seward, Chase was the most prominent Republican in the country and had done more against slavery than any other Republican. But he opposed a "protective tariff", favored by most other Republicans, and his record of collaboration with Democrats annoyed many Republicans who were former Whigs. At the 1860 Republican National Convention, he got 49 votes on the first ballot, but he had little support outside of Ohio. Abraham Lincoln won the nomination, and Chase supported him. Chase was elected as a Republican to the U.S. Senate from Ohio in 1860. However, he resigned shortly after taking his seat in order to become Secretary of the Treasury under Lincoln. He was also a participant in the February 1861 Peace Conference in Washington, D.C., a meeting of leading American politicians held in an effort to resolve the burgeoning secession crisis and to preserve the Union on the eve of the Civil War. Chase served as Secretary of the Treasury in President Lincoln's cabinet from 1861 to 1864, during the Civil War. In that period of crisis, there were two great changes in American financial policy, the establishment of a national banking system and the issue of paper currency. The former was Chase's own particular measure. He suggested the idea, worked out the important principles and many of the details, and induced the Congress to approve them. It not only secured an immediate market for government bonds, but also provided a permanent, uniform and stable national currency. Chase ensured that the Union could sell debt to pay for the war effort. He worked with Jay Cooke & Company to successfully manage the sale of $500 million in government war bonds (known as 5/20s) in 1862. The first U.S. federal currency, the greenback demand note, was printed in 1861–1862 during Chase's tenure as Secretary of the Treasury. It was Chase's responsibility to design the notes. In an effort to further his political career, his face appeared on a variety of U.S. paper currency, starting with the $1 bill so that the people would recognize him. On May 5, 1862, Chase accompanied President Lincoln, Secretary of War Edwin M. Stanton, and Brigadier General Egbert Ludovickus Viele in what would become a pivotal week for Union forces. The presidential party left the Washington Navy Yard aboard a five-gun Treasury cutter, Miami, bound for Fort Monroe "to ascertain by personal observation whether some further vigilance and vigor might not be infused into the operations of the army and navy at that point" to determine whether Norfolk could be captured. After a 27-hour trip, the Miami reached Fort Monroe on the night of May 6. Chase went with Major General John E. Wool, in command of the Federals at Fort Monroe, to inspect beach locations for a potential troop landing and relayed to Lincoln that he and General Wool had found "a good and convenient landing place" on the south shore, safely away from the Confederates' ironclad, the CSS Virginia. Chase's participation in the reconnaissance ended with the surrender of Norfolk and the destruction of the Virginia. On October 10, 1862, Secretary of the Navy, Gideon Welles wrote that "a scheme for permits, special favors, Treasury agents, and improper management" existed and was arranged by Treasury Secretary Chase for General John A. Dix. The motive of Chase appeared to be for political influence and not for financial gain. Perhaps Chase's chief defect was an insatiable desire for high office. Throughout his term as Treasury Secretary, Chase exploited his position to build up political support for another run at the Presidency in 1864. He also tried to pressure Lincoln by repeatedly threatening resignation, which he knew would cause Lincoln difficulties with the Radical Republicans. 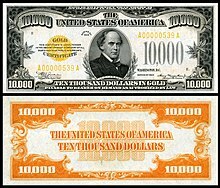 To honor Chase for introducing the modern system of banknotes, he was depicted on the $10,000 bill printed from 1928 to 1946. Chase was instrumental in placing the phrase "In God We Trust" on United States coins in 1864. In June 1864, Lincoln surprised Chase by accepting his third offer of resignation. The Republican Party had at that point already nominated Lincoln as its presidential candidate and the Treasury was in solid shape, so Lincoln no longer needed to keep Chase in the cabinet to forestall a challenge for the presidential nomination. But to placate the Radical wing of the party, Lincoln mentioned Chase as a potential Supreme Court nominee. When Chief Justice Roger B. Taney died in October 1864, Lincoln named Chase to succeed him. Nominated on December 6, 1864 and confirmed by the U.S. Senate on the same day, he was sworn into office on December 15, 1864 and served until his own death on May 7, 1873. Chase was a complete change from the pro-slavery Taney; one of Chase's first acts as Chief Justice was to admit John Rock as the first African-American attorney to argue cases before the Supreme Court. Hepburn v. Griswold (75 U.S. 603), 1870, which declared certain parts of the legal tender acts to be unconstitutional. When the legal tender decision was reversed after the appointment of new Justices, in 1871 and 1872 (Legal Tender Cases, 79 U.S. 457), Chase prepared a very able dissenting opinion. As Chief Justice, Chase also presided at the impeachment trial of U.S. President Andrew Johnson in 1868. As the justice responsible for the 4th Circuit, Chase also would have been one of two judges at the trial of Jefferson Davis (who was imprisoned at Fort Monroe in Virginia,) because trial for major crimes such as treason required two judges. However, Davis' best defense would be that he forfeited U.S. citizenship upon secession, and therefore could not have committed treason. Convicting Davis could also interfere with Chase's presidential ambitions, described below. After passage of the 14th Amendment in 1868, Chase invited Davis' lawyer to meet with him privately, and explained his theory that Section 3 of the new Amendment prohibited imposing further punishment on former Confederates. When Davis' lawyer repeated this argument in open court, Chase dismissed the case, over the objection of his colleague, U.S. District Judge John Curtiss Underwood, and the government chose not to appeal the dismissal to U.S. Supreme Court. Chase gradually drifted back toward his old Democratic allegiance, and made an unsuccessful effort to secure the Democratic nomination for the presidency in 1868. He "was passed over because of his stance in favor of voting rights for black men". In 1871, The New Departure policy of Ohio Democrat Clement Vallandigham was endorsed by Chase. He helped found the Liberal Republican Party in 1872, unsuccessfully seeking its presidential nomination. Chase was also a Freemason, active in the lodges of Midwestern society. He collaborated with John Purdue, the founder of Lafayette Bank and Purdue University. Eventually, JP Morgan Chase & Co. would purchase Purdue National Corporation of Lafayette, Indiana in 1984. Congress was right in not limiting, by its reconstruction acts, the right of suffrage to whites; but wrong in the exclusion from suffrage of certain classes of citizens and all unable to take its prescribed retrospective oath, and wrong also in the establishment of despotic military governments for the States and in authorizing military commissions for the trial of civilians in time of peace. There should have been as little military government as possible; no military commissions; no classes excluded from suffrage; and no oath except one of faithful obedience and support to the Constitution and laws, and of sincere attachment to the constitutional Government of the United States. Grave of Salmon Chase in Spring Grove Cemetery; a Docent is dressed in period clothing. Chase died of a stroke in New York City on May 7, 1873. His remains were interred first in Oak Hill Cemetery in Washington, D.C., and re-interred in October 1886 in Spring Grove Cemetery, Cincinnati, Ohio. Chase had been an active member of St. Paul Episcopal Cathedral, Cincinnati. Chase's birthplace in New Hampshire was declared a National Historic Landmark in 1975. After Chase's death in 1873, the Supreme Court established a tradition that a newly deceased Justice's chair and the front of the bench where the Justice sat will be draped with black wool crêpe, with black crêpe hung over the Court's entrance. The Chase National Bank, a predecessor of Chase Manhattan Bank which is now JPMorgan Chase, was named in his honor, though he had no affiliation with it, financial or otherwise. In May 1865, Chase was elected a 3rd class companion of the Military Order of the Loyal Legion of the United States (MOLLUS). MOLLUS was an organization of Union officers who had served in the Civil War which allowed distinguished civilians who had supported the Union cause to join as 3rd class companions. Chase was one of the first to receive this honor and was assigned MOLLUS insignia number 46. Chase's portrait appears on the United States $10,000 bill, the largest denomination of U.S. currency to publicly circulate. The bill was last printed in 1945. In 1969, the Federal Reserve began withdrawing high-denomination bills from circulation and as of 2009 only 336 $10,000 bills had not been returned for destruction. Chase County, Kansas, and Chase City, Virginia, are named in his honor. Chasevilles in Florida, Massachusetts, North Carolina (which only lasted from 1868 to 1871), New York, Ohio, and Tennessee were also named for him. Camp Chase in Columbus, Ohio, and Chase Hall, the main barracks and dormitory at the United States Coast Guard Academy, is named for Chase in honor of his service as Secretary of the Treasury, and the United States Coast Guard Cutter Chase (WHEC 718) is named for him, as are Chase Hall at the Harvard Business School, Chase House at the Tuck School of Business at Dartmouth College, and the Salmon P. Chase College of Law at Northern Kentucky University. Although not referred to by name, Chase was portrayed by Shakespearean actor Montagu Love (who closely resembled him) in the 1942 film Tennessee Johnson during Andrew Johnson's impeachment scenes. Chase was also portrayed by Josh Stamberg in the 2013 movie Saving Lincoln. ^ a b "Justices 1789 to Present". www.supremecourt.gov. Washington, D.C.: Supreme Court of the United States. Retrieved January 19, 2019. ^ a b c d e f g "Salmon P. Chase". Retrieved September 20, 2015. ^ Morris, William W.; Krieger, E. B., eds. (1921). The Bench and Bar of Cincinnati: Commemorating the Building of the New Court House. Cincinnati: New Court House Publishing Company. p. 16. It is a coincidence that his county home near Loveland, later came into the possession, for a few years, of Judge Charles J. Hunt, during the years the latter occupied the local Common Pleas Court bench. ^ EB (1911), p. 955. ^ a b Ross, Ph.D., Kelley L. "Six Kinds of United States Paper Currency". Retrieved May 26, 2014. ^ Foner, Eric (1995). Free Soil, Free Labor, Free Men: The Ideology of the Republican Party Before the Civil War (Second ed.). Oxford: Oxford University Press. p. 83. ^ "Salmon P. Chase". Retrieved September 10, 2015. ^ Tarbell, Ida M. (1998). The Life of Abraham Lincoln Volumes 1 & 2. Digital Scanning Inc. p. 148. ISBN 978-1-58218-124-0. Retrieved October 2, 2017. ^ Geisst, Charles R. (1999). Wall Street. Oxford University Press. p. 54. ISBN 978-0-19-511512-3. ^ Honings, Diana. "The Long Blue Line: Cutter Miami, Abraham Lincoln and the destruction of CSS Virginia". Retrieved May 10, 2017. ^ "The Clyde Built Ships:Lady Le Marchant". Caledonian Maritime Research Trust. Retrieved May 10, 2017. ^ "Landing of Wool and Surrender of Norfolk". Historical Marker Database. Retrieved May 10, 2017. ^ Symonds, Craig L. (2008). "Lincoln and The Navy". American Heritage. Rockville, MD: American Heritage Publishing. 58 (6). Retrieved May 10, 2017. ^ pp. 166, 175, 177, 227, 318, Welles, Gideon. Diary of Gideon Welles, Secretary of the Navy Under Lincoln and Johnson, Vol. I, 1861 – March 30, 1864. Boston and New York: Houghton Mifflin Company, 1911. ^ "History of 'In God We Trust'". US Department of the Treasury. Retrieved December 11, 2011. ^ McPherson, James. Battle Cry of Freedom. Oxford: 1988. p. 841n. Print. ^ "Supreme Court Nominations: 1789-present". Washington, D.C.: Office of the Secretary, United States Senate. Retrieved January 20, 2019. ^ a b "The Impeachment of Andrew Johnson: Salmon Portland Chase". Impeach-andrewjohnson.com. Retrieved December 11, 2011. ^ p. 446, Vallandigham, James L. A Life of Clement L. Vallandigham. Baltimore, MD: Turnbull Brothers, 1872. ^ "Chief Justice Chase's Remains". The Evening Star. October 11, 1886. p. 3. ^ "Christensen, George A. (1983) Here Lies the Supreme Court: Gravesites of the Justices, Yearbook". Archived from the original on September 3, 2005. Retrieved September 3, 2005. Supreme Court Historical Society at Internet Archive. ^ See also, Christensen, George A., Here Lies the Supreme Court: Revisited, Journal of Supreme Court History, Volume 33 Issue 1, Pages 17–41 (February 19, 2008), University of Alabama. ^ Phelps, Jordyn (February 16, 2016). "Antonin Scalia's Supreme Court Chair and Bench Draped in Black". ABC News. ABC. Retrieved February 16, 2016. ^ Palmer, Brian (July 24, 2009). "Somebody Call Officer Crumb! :How much cash can a corrupt politician cram into a cereal box?". Slate.com. Retrieved July 24, 2012. Salmon Portland Chase at the Biographical Directory of Federal Judges, a public domain publication of the Federal Judicial Center. Flanders, Henry. The Lives and Times of the Chief Justices of the United States Supreme Court. Philadelphia: J. B. Lippincott & Co., 1874 at Google Books. Friedman, Leon. "Salmon P. Chase" in The Justices of the United States Supreme Court: Their Lives and Major Opinions. Volume 2. (1997) pp 552–67. Goodwin, Doris Kearns. Team of Rivals: The Political Genius of Abraham Lincoln (2005) on Lincoln's cabinet. Niven, John. Salmon P. Chase: A Biography (1995). Randall, James G. (1928–1990). "Chase, Salmon Portland". Dictionary of American Biography. 4. New York: Charles Scribner's Sons. pp. 27–34. United States Congress. "Salmon P. Chase (id: C000332)". Biographical Directory of the United States Congress. J. W. Schuckers, The Life and Public Services of Salmon Portland Chase, (1874). William M. Evarts (1874). Eulogy on Chief-Justice Chase. Gore Vidal. Lincoln. Salmon Chase is one of the major figures in this extensively researched historical novel. Cushman, Clare (2001). The Supreme Court Justices: Illustrated Biographies, 1789–1995 (2nd ed.). Supreme Court Historical Society, Congressional Quarterly Books. ISBN 978-1-56802-126-3. Frank, John P. (1995). Leon Friedman; Fred L. Israel (eds.). The Justices of the United States Supreme Court: Their Lives and Major Opinions. Chelsea House Publishers. ISBN 978-0-7910-1377-9. Warden, Robert B. (1874). An account of the private life and public services of Salmon Portland Chase. Cincinnati: Wilstach, Baldwin and Co. Authorized biography. Wikimedia Commons has media related to Salmon P. Chase. The Salmon P. Chase papers, including correspondence and a myriad of biographical materials spanning the years 1820–1884, are available for research use at the Historical Society of Pennsylvania. Biography at "Mr. Lincoln and Freedom: Salmon P. Chase"
The United States presidential election of 1856 was the 18th quadrennial presidential election, held on Tuesday, November 4, 1856. In a three-way election, Democrat James Buchanan defeated Republican nominee John C. Frémont and American Party nominee Millard Fillmore. Thomas Corwin, also known as Tom Corwin, The Wagon Boy, and Black Tom was a politician from the state of Ohio. He represented Ohio in both houses of Congress and served as the 15th Governor of Ohio and the 20th Secretary of the Treasury. After affiliating with the Whig Party, he joined the Republican Party in the 1850s. Corwin is best known for his sponsorship of the proposed Corwin Amendment, which was presented in an unsuccessful attempt to avoid the oncoming American Civil War. Thomas Morris was an American politician from Ohio who served in the United States Senate and was a member of the Democratic Party. In the 1844 presidential election, he was the vice presidential nominee of the anti-slavery Liberty Party. The 1860 Republican National Convention, also known as the 2nd Republican National Convention, was a nominating convention of the Republican Party of the United States, held in Chicago, Illinois, from May 16 to 18, 1860. The gathering nominated former U.S. Representative Abraham Lincoln of Illinois for President of the United States and Senator Hannibal Hamlin of Maine for Vice President. Noah Haynes Swayne was an American jurist and politician. He was the first Republican appointed as a justice to the United States Supreme Court. The Ohio Republican Party is the Ohio state affiliate of the United States Republican Party. It was founded in Columbus, Ohio on February 13, 1854. John Van Zandt was an abolitionist who aided the Underground Railroad resistance movement in Ohio after having been a slaveholder in Kentucky. Sued for monetary damages by a slaveholder whose escaped slaves he aided, he was a party to Jones v. Van Zandt (1847), a case by which abolitionists intended to challenge the constitutionality of slavery. The case was decided by the United States Supreme Court against Van Zandt; it upheld the right of Congress and the obligation of the government to protect slavery, as it was established under the Constitution. Van Zandt was ruined financially by the decision and died later that year. Katherine Jane ("Kate") Chase Sprague was a Washington society hostess during the American Civil War. During the war, she married Rhode Island Governor William Sprague. Rufus Paine Spalding was a nineteenth-century politician, lawyer and judge from Ohio. John Curtiss Underwood was a lawyer, abolitionist politician, and federal judge. Salmon P. Chase Birthplace was the birthplace and childhood home of Salmon P. Chase. It is located about 8 miles (13 km) north of Claremont on New Hampshire Route 12A. The ​2 1⁄2-story wood frame house was built c. 1790, and is a multi-section structure in an L shape. The main block is five bays wide and two deep, with a centered entry that has Greek Revival pilasters on the central entry and on the corners. This block faces west, and two narrower sections extend east from the rear. The first of these sections is also ​2 1⁄2 stories, with two chimneys. The easternmost section is 1-1/2 stories, and was originally connected to a barn. The house is believed to be well-preserved, but there is no documentary evidence of its appearance in the early 19th century, and it is known to have been moved across the street from its original site in about 1848. The Taney Court refers to the Supreme Court of the United States from 1836 to 1864, when Roger Taney served as the fifth Chief Justice of the United States. Taney succeeded John Marshall as Chief Justice after Marshall's death in 1835. Taney served as Chief Justice until his death in 1864, at which point Salmon P. Chase took office. 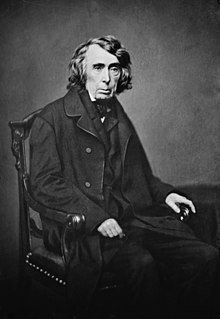 Taney had been an important member of Andrew Jackson's administration, an advocate of Jacksonian democracy, and had played a major role in the Bank War, during which Taney wrote a memo questioning the Supreme Court's power of judicial review. However, the Taney Court did not strongly break from the decisions and precedents of the Marshall Court, as it continued to uphold a strong federal government with an independent judiciary. Most of the Taney Court's holdings are overshadowed by the Dred Scott decision, in which the court ruled that African-Americans could not be citizens. However, the Taney Court's decisions regarding economic issues and separation of powers set important precedents, and the Taney Court has been lauded for its ability to adapt regulatory law to a country undergoing remarkable technological and economic progress. The Chase Court refers to the Supreme Court of the United States from 1864 to 1873, when Salmon P. Chase served as the sixth Chief Justice of the United States. Chase succeeded Roger Taney as Chief Justice after the latter's death. Appointed by President Abraham Lincoln, Chase served as Chief Justice until his death, at which point Morrison Waite was nominated and confirmed as his successor. John McLean was an American jurist and politician who served in the United States Congress, as U.S. Postmaster General, and as a justice of the Ohio and U.S. Supreme Courts. He was often discussed for the Whig and Republican nominations for President. Roger Brooke Taney was the fifth Chief Justice of the Supreme Court, holding that office from 1836 until his death in 1864. He delivered the majority opinion in Dred Scott v. Sandford (1857), ruling that African Americans could not be considered citizens and that Congress could not prohibit slavery in the territories of the United States. Prior to joining the Supreme Court, Taney served as the United States Attorney General and United States Secretary of the Treasury under President Andrew Jackson. Levi Woodbury was an Associate Justice of the Supreme Court of the United States, a U.S. Senator, the 9th Governor of New Hampshire, and cabinet member in three administrations. William Yates Gholson was a Republican politician in the U.S. State of Ohio who was an Ohio Supreme Court judge from 1859 to 1863.